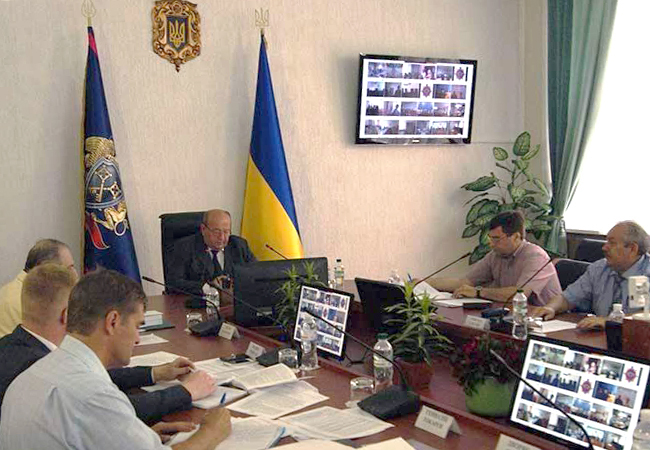 The European Union Advisory Mission Ukraine (EUAM Ukraine) advised the administrative personnel of the State Penitentiary (SPS) Service Medical Department concerning international prison health care standards that are not duly implemented in prisons day-to-day practice. A relevant thematic seminar organized by Kharkiv Human Rights Protection Group took place at the State Penitentiary Service Headquarters. The event was attended by the administration of the State Penitentiary Service Medical Department and heads of its regional offices. It was also streamed online to other administrative staff from Medical Departments of all regional Penitentiary Service Administrations across the country. EUAM Penitentiary Senior Assistant, Vadym Chovgan, suggested to the SPS medical personnel the ways to implement improved health care standards of the European Committee for the Prevention of Torture and the European Court of Human Rights. Prisoners’ awareness about procedures of access to prison doctors. The participants directly discussed the above-mentioned advice with the medical service administrators from the SPS and its local administration. EUAM Ukraine continues to be active in the area of penitentiary.